Tempur Pillows are the best in the business and in this review I’m going to explain to you why. Tempur were the original pioneers of memory foam after NASA, the original inventors, who made the material available to the public in the 1980s. A team of scientists then carried on the research for another 10 years before perfecting Tempur memory foam. Other companies have since tried to imitate the Tempur memory foam but they have yet to succeed. Most known for their mattress Tempur also have a range of four different pillows each one suited to a different person. I’ve put them into a table below so you can see the differences and then I’ve gone on to include a review of each one individually. The four types are: Original Contour Memory Foam, Comfort, Cloud and Traditional. Price Click Here! Click Here! Click Here! Click Here! 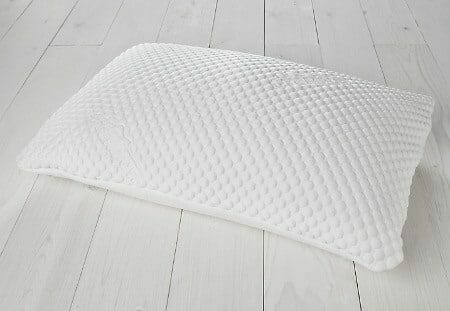 If you have tried other memory foam pillows and not been impressed then you should definitely try a tempur pillow before you rule them out. They have long been the best and will stay the best for the foreseeable future. Tempur products are purchased for nursing homes, hospitals and sleep centers the world over so you can trust that you’re getting the absolute best. They also come with a removable machine washable cover which is handy, but more often than not here in the UK things don’t dry in one day, so it’s worth getting an extra pillow cover. With the contour pillow you need to get the tempur pillow case (It’s like they did it on purpose..) due to the shape of it but it’s handy for the other pillows too, it’s fitted similar to a fitted sheet so you can just pop it on and off. Perfect for when you’re letting your normal cover dry. For some reason John Lewis sometimes list the filling as Visco Elastic which doesn’t really mean anything. Memory foam is a Viscoelastic material which means it changes shape with heat as it’s supposed to. So be assured that all tempur pillows are memory foam, I think it was someone not doing their research properly! Nothing is better for sorting out your neck pain than the Contour pillow. It provides the absolute best support to your neck and shoulders while still being comfortable enough for a good night’s sleep. It does take some getting used to but it is the best solution that exists for neck pain while you’re sleeping so well worth bearing through for. The contour shape helps to cradle the head while on your back or side helping to keep your spine properly aligned. Neck pain happens because your head is not supported and it causes the top of your spine to lie squint. Check out the diagram below to see what I mean. So the contour pillow properly aligns everything getting rid of morning neck pain once and for all. Make sure you don’t put this pillow inside any other pillow case because you will likely ruin the shape and definitely affect the benefits if you do! Just keep with the case it comes with to ensure a comfortable sleep night after night. The contour is available in a medium or large size with the large version of the pillow being a little deeper for those with broader shoulders. The Cloud pillow is exactly as dreamy as it sounds. The softest of the Tempur pillows but still memory foam for extra support with marshmallow softness. 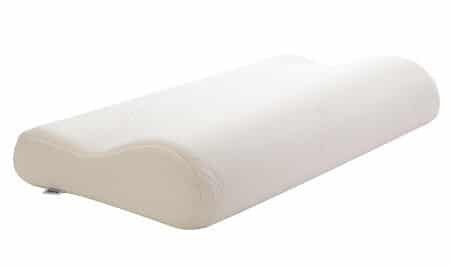 It is also the only memory foam pillow suitable for front sleepers, most are too bulky but the Cloud is just right. The cloud pillow also comes with a cotton pillowcase but again can fit snugly into most normal pillow cases so you can keep your bed spread the same. But the best part is it’s the cheapest of all the pillows. Woohoo! The comfort pillow has medium firmness with a good balance of comfort and support for those who don’t like to sink in too deep to their pillows. Another great pillow from the masters, this one is best for back sleepers where sinking a little deeper isn’t a problem. Side sleepers tend to need something firmer to hold their head higher from the bed. Another snug fit into a pillow case keeps your bed looking the natural. A lovely plump pillow with extra support for back sleepers who like to sink a little into their pillows. The traditional pillow offers a firm feel with plush comfort and support, if your neck pain isn’t too serious then this will still be miles above getting a synthetic or feather filling. It’s most suited for side sleepers but for men with broader shoulders you might need a little extra lift. Two of these will be too big but you can use a regular pillow underneath to help hold your head a little higher. And that covers it! If you found this article useful I’d really love for you to share it out with your friends!